It’s the thumping heart, the sweaty palms, and the seeming inability to communicate verbally to the person across from you. It’s the fear that everyone is silently judging you, and if you make eye contact with them something disastrous could happen. And it’s the isolation you feel it an overwhelmingly crowded place, when the smallest task takes all your energy to complete. Social anxiety is a beast. Some of us experience it momentarily, like on the first day of a new job, when we enter a uber-competitive environment or see colleagues in an unexpected place. Other people experience it all the time, and a ‘simple’ activity like shopping or going out to dinner nearly feel unbearable. As someone who still deals with social anxiety, I know what it’s like to freak out over the simplest tasks. And even though I’ve combatted a lot of my (somewhat irrational) fears over the years, I still panic when I encounter a new situation, I’ve just learned to mask it a lot better. 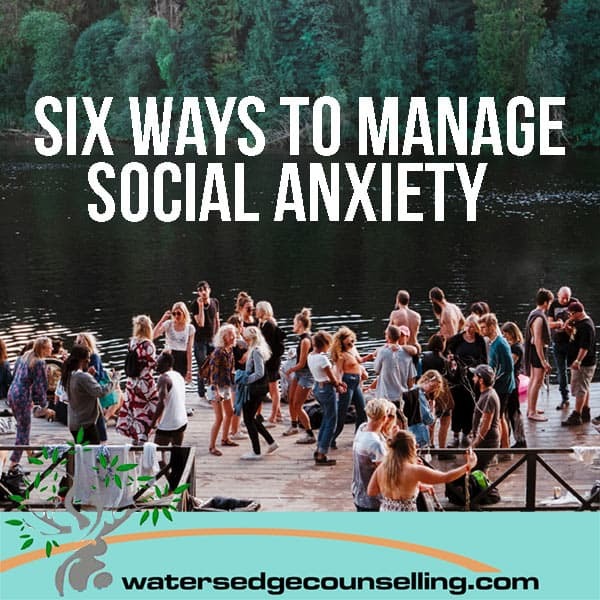 If you also struggle with social anxiety, here are six ways you can begin to manage it. Feeling anxious about a situation you think ‘normal people’ are fine with only makes your fear escalate. While not everyone experiences social anxiety, we all feel some sort of awkwardness. Remember that you’re not the only one who feels uncomfortable around people. In fact, there are probably others around you at this moment experiencing a similar level of anxiety, you just can’t tell because most of us laugh it off or hide it. I’m a terrible decision maker at the best of times, and when I’m in an uncomfortable situation my inability to choose between chai tea and a mocha latte becomes impossible. So when possible, plan where you’re going and what you’ll do there. If you’re going to an event, make a time to meet up with a friend so you’re not left on your own. If being in a crowded space troubles you, go at a less-busy time, and if talking to a cashier freaks you out, have your money set aside for them before you approach the counter. These are only small steps, but they can help you to avoid an anxiety attack. If you struggle in a particular situation, don’t be ashamed to let someone know. A loved one, partner, spouse or friend will likely have already picked up that you’re uncomfortable in some situations, and telling them you have social anxiety will help them to connect the dots. You can’t always avoid anxiety, but having someone around who understands what you’re experiencing makes a world of difference. Tell them what you need to feel calm, and let them help you to plan for and work through each situation. When you’re anxious about something, you might role-play different scenarios in your head until you’re so afraid you decide not to complete the task. It’s important that you consider the event or situation you are entering, but catastrophising about what may occur if you see x or what could happen if you say x, only heightens your emotions. Before you enter an anxiety-provoking scenario, write down your fears, hopes and expectations around the event. For each fear or problem, write down a possible solution. You may find that just by writing it down, you take away its power and feel more empowered. Go back over the list when the event is complete, and see what actually occurred. Over time, you’ll begin to control your fear when you realise more often than not, scenarios aren’t as bad as they seem. My anxiety is always worse when I am tired and stressed, and I know it’s time to go home when I become unresponsive or irritable. Over time, you’ll learn the physical and mental symptoms you show when you’ve had enough and this will be a sign that you need to have some alone time. How intense the environment is, the level of social interaction you’ve had and how long you’re out will affect this, so set a time frame for each situation and give yourself permission to leave when its done so you can care for yourself. If your social anxiety is all consuming and you struggle to leave the house, make a phone call or see people, then seeing a counsellor or psychologist is a great first step to managing it. Lots of places allow you to research therapists online, and some even let you book over the Internet. Ask a friend to drive you to the appointment, and if this feels like too much, ask the therapist if you can connect over Skype or email instead. It takes time to overcome social anxiety, and for some people (myself included), it becomes a process of learning to manage it. Wherever you’re at, know you’re not alone in these emotions. You can navigate them and with a bit of support, learn to live a happy and healthy life. It just starts with asking for help. Do you struggle with social anxiety? Would you like some help overcoming your fears? Here’s what you need to do: Contact Colleen on 0434 337 245 or Duncan on 0434 331 243 for a FREE 10-minute phone consultation on how we can best help you or book online now.